Al Harum began honing his tennis skills at Salvadore Park in Coral Gables at age seven, and later went on to become one of the top netters in Miami history. Harum, a four-year letterwinner, was a member of four consecutive undefeated squads at UM, from 195201956. He also enjoyed a stellar high school career during which he was the No. 2 ranked boy player in 1949, and won the state high school championship in 1952. While at UM, Harum earned the right to be team captain and the No. 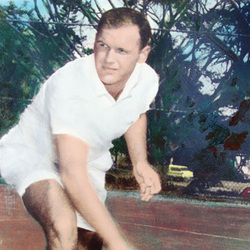 1 singles player during his junior and senior seasons, and was the Florida State men's champion in 1954. Although being named the 1954 UM Athlete of the Year is special to Harum, his greatest achievement during his college days may have been his victory over Kurt Nielson, who was once a finalist at Wimbledon. Harum also went on to claim the U.S. Air Force Championship as Hawaii's Territorial Champion in 1959. Harum, born in Brooklyn, New York, currently directs his own law firm and resides in Miami.